Can you believe Christmas is in just 6 short weeks? I can’t! November and December are often my biggest months for baking. While I love making sweet treats all year round, there’s something special about baking at the holidays. I think it has something to do with it being cold (and often snowy) outside yet the oven is on and the kitchen is warm and inviting. The scent of cookies, cakes, and cupcakes fills the air. I am the baker in the family so every year I have fun trying to outdo myself from the previous year. Some years I’ve made elaborately themed decorated sugar cookies and other years I’ve made over the top cakes. No matter what I make, it’s fun to get into the kitchen and put together flavors I think my family and friends will like. I also get to bake for my students every year. 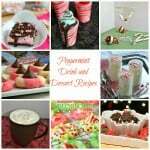 I have my monthly reward party for good behavior and the December party is always the favorite because the kids love Christmas and get to enjoy a treat I’ve made just for them. Speaking of my students, did you know that hungry children and families often miss out on the essential nutrients supplied by milk because it’s something that isn’t often donated to food banks? Milk is often in high demand at food banks but on average food banks are only able to provide the equivalent of less than one gallon of milk per person per year. This holiday season you can make a small donation at pourmilklove.com and The Great American Milk Drive will deliver a gallon of milk to a family in need in YOUR local community. 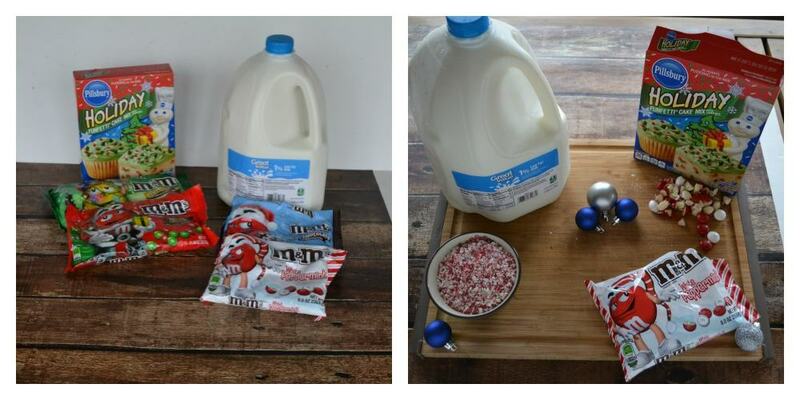 If you are into holiday baking like I am you can also purchase 2 bags of M&M’s® at Walmart (9.4 oz bags or larger) and up to a gallon of milk will be donated to the drive! It’s a win-win! 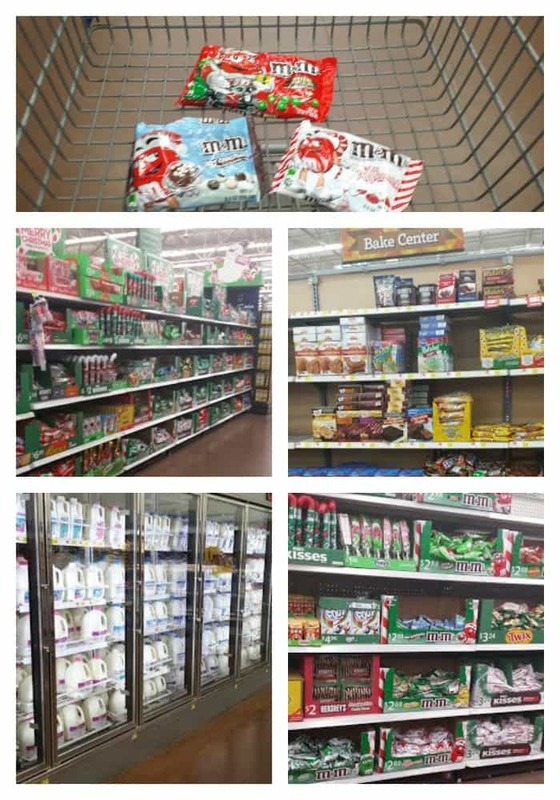 Thinking about M&M’s®, on my most recent trip to Walmart I saw that they have the holiday M&M’s® out! I went a little crazy and bought M&M’s® White Peppermint, M&M’s® Hot Chocolate, M&M’s® Holiday Peanut, and M&M’s® Holiday Milk Chocolate. It might seem like a lot of chocolate but with the large amount of baking I do at this time of year I’d be surprised if they last me to the second week of December! Since I bought chocolate I also had to get a gallon of Great Value Milk because you can’t eat sweets without a tall glass of milk I took a quick peak at the holiday baking aisle as well and grabbed a few boxes of Pillsbury™ Funfetti® Holiday Cake Mix as well. Once I got home I put all my goodies out on the table and grabbed my notepad. I’m big into looking at my ingredients and making a list of fun flavor combinations and recipe ideas before I actually begin cooking. I came up with 4 ideas and the first one I wanted to make was a White Chocolate Peppermint Cupcake with Hot Chocolate Frosting. How awesome does that sound? Nothing says Christmas quite like hot cocoa and peppermint so I knew this would be a winning combination. While I knew I could make the batter from scratch, I’m always worried about time during the holiday season so I grabbed one of my boxes of Pillsbury™ Funfetti® Holiday Cake Mix. The cake mix calls for 1 cup of water but I’ve found if I substitute in 1 cup of milk it really makes the cupcakes taste good. Plus, since I just bought a gallon of Great Value Milk, I had plenty to use in my recipe. Just looking at the title of my cupcake recipe would probably make you think it’s complicated and that it’s going to take a long time to make but this is seriously one of the easiest cupcakes I’ve ever made! 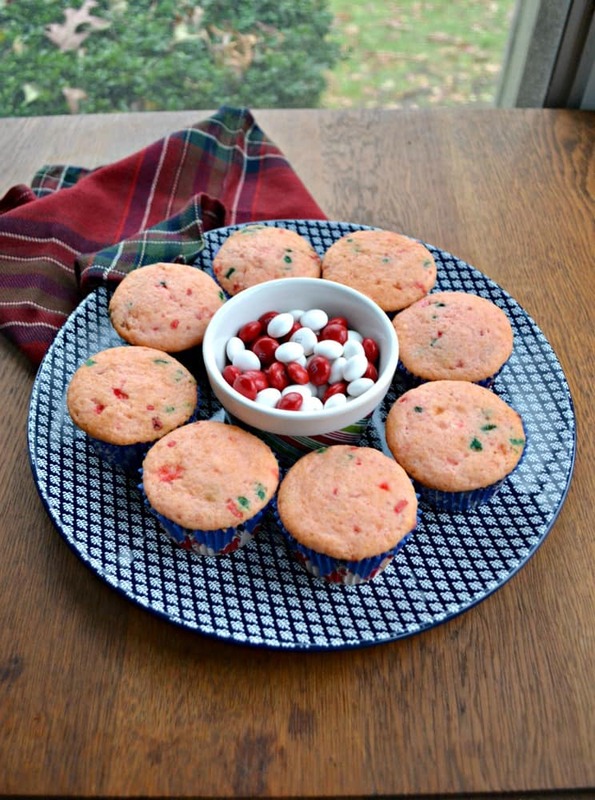 The cupcake is made with the Pillsbury™ Funfetti® Holiday Cake Mix, M&M’s® White Peppermint, and crushed peppermints. That’s it! 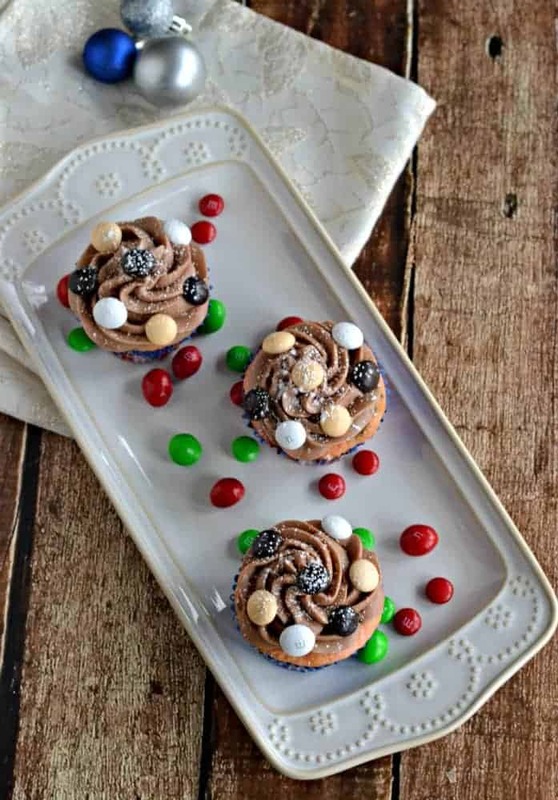 Then the frosting is a quick and easy buttercream frosting enhanced with real hot chocolate and decorated with M&M’s® Hot Chocolate. I whipped this up in the kitchen on Monday and was done in under an hour and had 2 dozen cupcakes to show for it. The cupcake is moist and has flavors of peppermint and white chocolate while the frosting tastes like hot chocolate! 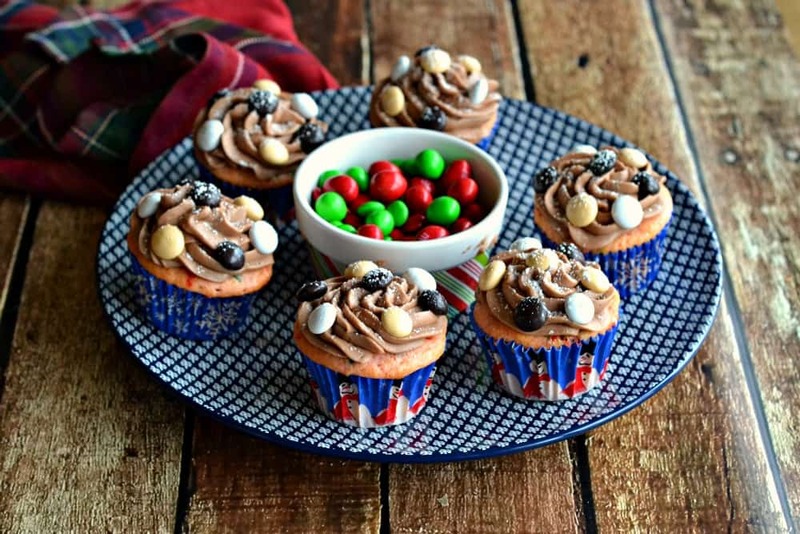 I topped the cupcakes off with more M&M’s® Hot Chocolate and a dusting of powered sugar. 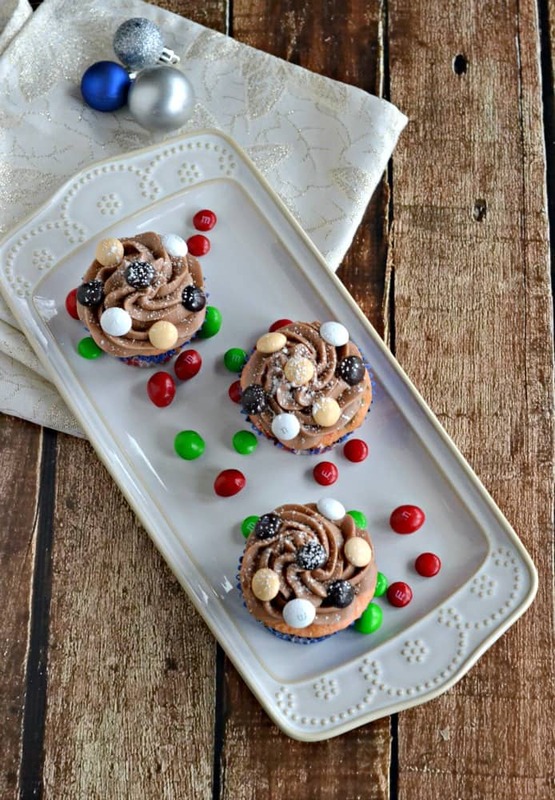 A moist and delicious white chocolate peppermint cupcake topped with Hot Chocolate Frosting! In a large bowl combine the cake mix, milk, oil, and eggs. Mix well for 2 minutes or until well combined. Fold in the M&M's® White Peppermint and crushed peppermints. Pour the batter into the prepared muffin tins, filled ⅔ of the way full. Bake for 20-23 minutes or until a toothpick inserted into the center comes out clean. Remove and cool on wire racks. To make the frosting place the butter in a large bowl and beat with a hand mixer until smooth. Add in the hot chocolate and beat until smooth. Add the powdered sugar, ½ cup at a time, until desired consistency is reached. Pipe the frosting onto the cooled cupcakes. Decorate each cupcake using M&M's® Hot Chocolate. Then sprinkle the tops of the cupcakes with powdered sugar. I’ve shared my holiday recipe now I want to hear from you! What is your favorite holiday recipe? If you’d like to find more holiday recipes click HERE. 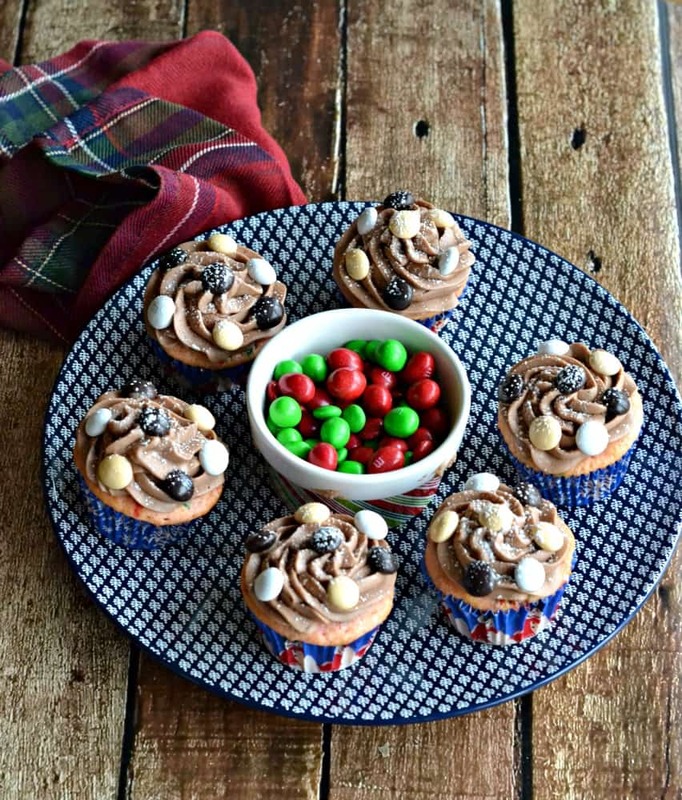 If you’d like to try to make these cupcakes or your own M&M’s® creation click HERE to Save $1.00 on ANY TWO (2) M&M’s® Chocolate Candies, 8 oz or larger. 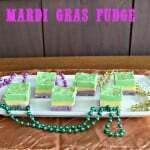 These look really yummy. I voted for you too. Hope you win!